TUI NA MASSAGE - LISBON - The ancient chinese massage - Terra Heal "wellness & health"
Tui Na treats chronic pain, especially that caused by muscle-skeletal conditions and injuries. Neck, shoulder and back pain and immobility, sciatica and 'tennis elbow' all respond very well. This ancient Chinese bodywork is now gaining rapid acceptance in the Western world. Tui Na (pronounced 'twee-nah') massage is a complete healing system, like acupuncture and Chinese herbal medicine. These three forms of therapy are the main components of Traditional Chinese Medicine (TCM). Tui Na is probably the oldest system of bodywork still practised yet its popularity continues to grow. The techniques of Tui Na and details of its uses in treating a range of health problems were already documented in a vast treatise - The Yellow Emperor's Classics of Internal Medicine, written about 2500 years ago. After such a lengthy period of development and evolution, modern Tui Na is the most tried and tested hands-on therapy in the world. How does it work? Tui Na works in accordance with the complex theory of TCM. Fundamental to this theory is the life powering energy that the Chinese call Qi (pronounced 'chee'). Every aspect of bodily function depends upon Qi and its flow through the tissues. The Chinese recognise a network of 12 paired meridians - one member of each pair on the right side of the body and the other on the left. There are also two unpaired meridians that encircle the trunk and the head in the mid-line. These meridians are not like vessels, they have no anatomical structure but they are pathways along which the main flow of Qi occurs. It is best to visualise them as precise currents of Qi, just like currents of water in the oceans. Interestingly, Western scientific methods have been used to plot the courses of these meridians, and they confirm the accuracy of detailed maps produced around the time of The Yellow Emperor's Classics of Internal Medicine. When Qi flow is disturbed anywhere in the body, Qi imbalance that results can cause pain, stiffness, sickness - even emotional pain. The Chinese believe that health and vitality depend on Qi balance in the body. Tui Na is one of the best ways of achieving this and it uses an array of techniques to do it. 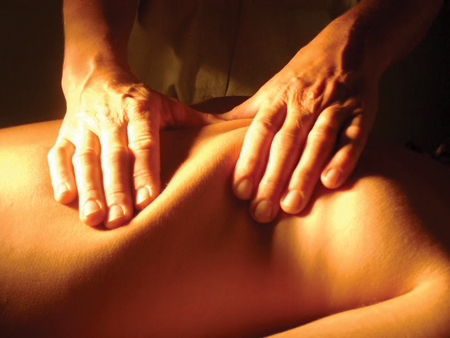 It is a very vigorous massage; every technique requires movement as well as pressure, After the first session you may feel a little sore but after two or three more most people adjust to the deep pressure. Depending on the type of Tui Na treatment you have, you might leave feeling a bit light headed. Some patients experience sleepiness while others feel supercharged. Almost always, everyone feels better after Tui Na. As with acupuncture, Tui Na produces many side effects, but all of them are positive. A common example is the person treated for chronic back pain finding that their chronic constipation has also been eased. This is because the pain treatment focuses on the Bladder meridian which links directly into the Qi energies of the large intestine. Sometimes side effects can be very emotional and patients feel like crying uncontrollably.